I love Brandon Sanderson. Not the man... but his books. They're so good. With the exception of his very first novel, Elantris, I've loved every single book or novella of his that I've read. I recommend them to people all the time. 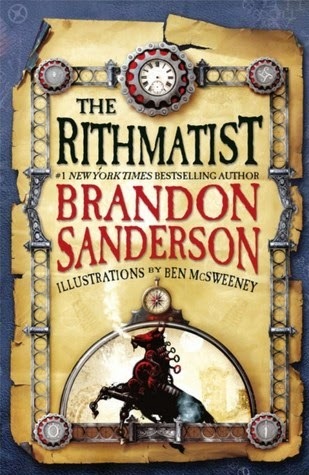 I just finished listening to the audiobook version of The Rithmatist. I've read the book a few times before, so the audiobook was a change of pace. But, it was great! The world of The Rithmatist is basically an alternative history version of the early 1900s in the U.S. Some major event has shaken the world, changed the landscape, and created a new form of science/math called Rithmatics. Those in the world who are Rithmatists can use chalk to do things that would be considered magic in other circumstance, but it conforms to a very precise set of laws and theories. It's an interesting setting. We learn throughout the book that wild creatures called chalklings may be on the loose. They are animated chalk-like drawings that can interact with the world. I don't know how much more to talk about the setting and the story, I'm afraid I could ruin it for anyone interested in reading the book. If you're already a Brandon Sanderson fan you should definitely read this book. If you haven't ever read a Sanderson book this is actually a great entry point into his work. It's a quick read that will let you see his ability for amazing world building. I highly recommend it. You didn't like Elantris? Did you write a review of it somewhere that I can read to see why not? It's his only writing that I haven't liked. I don't think I've ever written up a review for it. Honestly, it all came down to pacing. The characters and the world that he built were great, but the book should have been like 1/3 the length that it was. There was so much filler and so many slow sections. Yeah, I guess I can see that. OTOH, I didn't mind those either, since the characterization and world-building was, IMO, well done. I've never heard of Brandon Sanderson. I shall add him to my list of authors/books to check out. But first I need to get through the massive pile of books that my husband has helped me pile onto the bedside table as he finished books for his English Ed degree.